Poor employee performance hurts an organization. Low productivity, incompetence, and unneeded expenses are the last thing organizations want at any time, particularly in today’s tough economy. After decades of work in the field of business and human resources, I know that few things upgrade and energize an organization like a solid Performance Management System. A performance management system incorporates your organization’s Mission, Vision and Values as well as your annual goals and objectives to create the structure and accountability by which an employee can accomplish these goals and objectives and, more importantly, improve their lives. Only the highest-performing organizations make the performance review process a valued, appreciated, and eagerly anticipated system for the both organization and its employees. Sadly, many organizations do not systematically review or improve employee performance at all! This leads not only to unmet expectations from the management’s point of view, but also creates confusion and frustration for employees. The result is poor performance and money down the drain. Other times, organizations attempt to implement a yearly review but end up doing it backwards and it becomes counter-productive. This article will teach you how avoid this pitfall. Television and film have lampooned the phenomenon, highlighting the common foreboding employees feel and the waste of time such a meeting can be. How can you implement a Performance Review System that will consistently improve employee productivity and competency, save costs, and have eager employees lining up for it? Mistake # 1 The leader fails to include input and participation of the employees at the beginning of the process. The best performance programs are employee-driven. The leadership works in a “guide and support” role. This is a significant shift, but one that can make or break your organization. When the process of improvement and review is centered on and driven by the employees, it creates an emotionally potent sense of ownership and cooperation. Instead of being hounded and rebuked by a controlling boss, the employee is the source of increased performance through an active and vested role. It behooves an employee to generate high performance and a good system will take this into account by providing employees the dignity of being responsible to see the improvement process through to the end. The performance program should encourage and reward employees who initiate performance conversations with management. A program executed well will encourage the employee to want to do better as he/she makes the efforts necessary to ensure it happens. Mistake #2 Leaving out personal development. Never forget the vital career development component. A simple career development piece can do wonders for employee morale and can be easily built right into your performance program. Employees naturally want to improve their lives and better their circumstances. A career development component helps employees know, envision, and subsequently achieve promotions, positions, and greater responsibility within your organization. A career development focus gives the employee the opportunity to take ownership of their career destiny. A good career development component helps the employees ascertain what they need to do to close the gaps in their experience and education in order to be promoted to other positions. Many great programs include education and seminars, but some cleverly include short-term assignments in other positions to gain vital hands-on experience. Implementing a proper performance program may seem daunting, remember that employees are not just your greatest assets; they are the key to ensuring that you can thrive in challenging economic times. In the secular world an organization focused on quality might state its core value as: We do not compromise on quality. Quality is job one. An organization valuing individual responsibility would want to say: We believe in holding ourselves accountable. We deliver on our promises and we always endeavor to use good judgment. Efficiency, honesty, customer service, ownership—these and many more reflect the kinds of core values that high-performing organizations embody. In order to enjoy growth and prosperity and achieve high performance, an organization must first look inward and thoughtfully address these three critical aspects of running an organization. Those that invest in a well-developed and bought-in mission, vision, and values will reap dividends far beyond those that do not. As leaders at Christian colleges and Universities, we take a Biblical/Kingdom approach to our Mission, Vision and Values creation. Often times it is best to cite a bible verse to stir commitment and affirmation as to why the value is important. In doing research we discovered Ozark Christian College’s Values Statement. Enjoy reviewing and reflecting how your Values statement might be updated or recast to create excitement on your campus. We believe the Bible is the true and authoritative Word of God and our final rule of faith and practice. We want to teach God’s Word faithfully, in harmony with God’s Spirit. We are a servant of the church, training vocational and volunteer servant leaders for the worldwide work of ministry. It is the commitment of teachers, staff and students that we will love and serve others. We want to honor God by fulfilling our personal responsibility to be honest and caring with one another. We are absolutely and utterly dependent upon God. The work is too great for human resources. We pursue excellence, knowing all glory is God’s and any accomplishment is of him. We accept one another as imperfect people saved by the grace of God. Mutual trust, based on our commitment to the Lord, guides our relationships. We desire each person to have freedom to develop God-given gifts. We are committed to teaching and practicing biblical Christianity, believing it is central to unity among believers and evangelization of the world. We foster spiritual health through genuine worship, both personal and public. Worship is for the glory of God, exhortation from his Word, and edification of the community of faith. Vision statements should consider how the market and your customer base may change within the next three, five, or seven years, how such changes can create opportunities for your organization, how to bridge the distance between how things are today and where you envision you want to be within your established timeframe, how you will surpass your competitors in order to gain greater market share, and also what you are doing collectively to capitalize on the changes in business conditions and your business’s needs. So, whereas the mission is what an organization does best every day, its vision is what the future looks like when it fulfills its mission exceedingly well. Some effective vision statements include Nike: To be the number one athletic company in the world, and Amazon: Our vision is to be earth’s most customer-centric company; to build a place where people can come to find and discover anything they might want to buy online. When I worked for Gatorade, we developed an incredible advantage over the competition because we took the time to establish its vision, where they were going and when they wanted to get there, and ensured that every employee shared this vision. Gatorade’s competitors at the time, Powerade and All Sport, faded away as a result, because they lacked a commonly shared vision, they lacked direction—they lacked a road map. When we meet with people to discuss strengthening their HR practices, we often use the term “Kingdom-minded organization.” More often than not, they are intrigued as to precisely how we define what potentially encompasses a considerably broad scope or approach. Certainly, many Christian business people, academia professionals, pastors, and consultants have their own ideas as to what constitutes a Kingdom-minded organization. My own Kingdom-minded human resources organization has worked hard to develop what we feel is a clear, actionable, and measurable articulation of just what a Kingdom-minded organization means to us and how to achieve it, and, as a result, the organizational leaders we work with express enthusiasm to achieve these goals, and are willing to invest their precious time, dollars, and energy into making their organization a prosperous one, and one reflective of Christ and His teachings. In terms of what comprises the framework of a Kingdom-minded organization, the model I developed contains principles that apply to marketplace organizations, colleges and universities, churches, and non-profit organizations alike. A Kingdom-minded organization puts Christ first, with a focus on integrity, honesty, and straightforward dealings with students, alumni, parents, staff, contractors and suppliers, etc. Such an organization possesses clearly delineated mission, vision, and core value statements. It has agreed upon goals and objectives, especially in the realms of mission execution, customer service, production, and quality. Being a Kingdom-minded organization does not in any way preclude prosperity. On the contrary, it aims to be prosperous for the benefit of its key stakeholders, leadership, owners, employees, and the organization’s community. They should—they must—strive to do great things, marrying their godly goals with the fruits of success, those of a job well done. By no means should they consider themselves as unable to participate in the results-driven culture of winning U.S. organizations. When mapping out the future of an organization that professes to strive to become high performing, management must create its mission, vision, and value statements (MVVs) or ignite existing ones by recreating them. 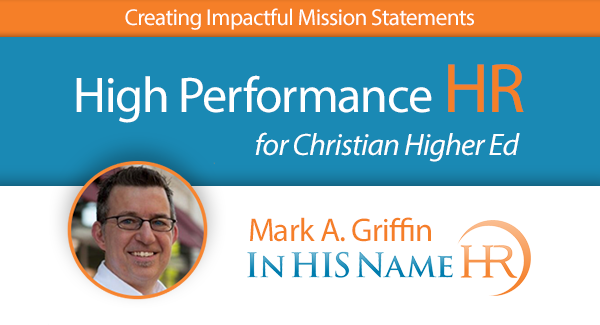 Much has been written on what should comprise mission, vision, and value statements. I always suggest keeping them simple—simple concepts that all employees can remember and fully support. It’s difficult to fully commit to and “own” an organization’s ideals if they are so complicated, convoluted, or vague that the employees can’t remember them clearly. When I was asked to blog about forward-thinking human resources content to Christian Higher Ed Professionals, I knew I would have to start by constructing a solid foundation and build upon that. Having spent over 25 years in corporate America working alongside highly respected HR thought leaders at such organizations as Kodak, PepsiCo, and Merck Inc., I thought back to what makes certain organizations succeed while others fail. 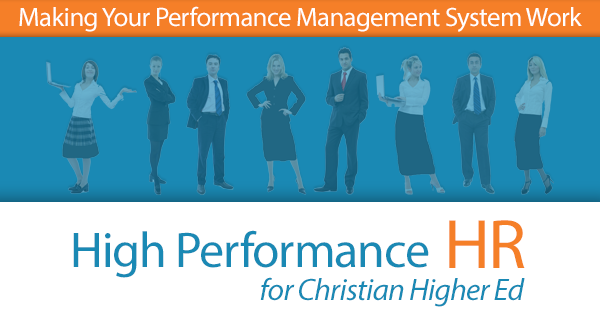 Six years ago, I founded and now lead a growing HR consulting firm that supports organizations across the United States, organizations with one thing in common—they are Christian-based, whether for-profit companies or ministries and churches, and all possess essentially the same strengths, weaknesses, and opportunities. No amount of technology or reengineering solves their issues. At the end of the day, it is the people within those organizations who make the difference. What singles out certain organizations is the ability of their leadership to align their people effort to a collective MVV—mission, vision and values. Without this foundation, organizations flounder and employees lack direction. Without identified and established MVVs, HR leaders are unable to align their HR programs to achieve high performance. I have witnessed firsthand what happens when organizations lack this essential organizational mantra. What’s tragic is that establishing a company’s MVV is not only basic but quite simple to do. It requires nothing more than to identify why you do what you do and how you want to do it. In the coming posts, I will guide you through the necessary steps to identify your core beliefs and goals, your MVV. Then we will explore how to skillfully integrate this MVV into your HR process to ensure you deliver on your mission, achieve your vision, and work within the values you establish. I will also define for you a term we use: “Kingdom-minded organization.” In my experience, the use of this Christian-oriented term illuminates how your organization will present its MVV differently to those of secular organizations. Once you spend some time reflecting on what is meaningful to you and your organization, you will have taken the first steps on our journey together to create a Kingdom-minded organization of like-minded individuals working together to achieve high performance. In His Name HR helps organizations build high-performance Human Resources programs. Visit them at In HIS Name HR or e-mail them.